Good Morning Onward Nation…I’m Stephen Woessner. During today’s solocast…I am going to dig really deep — get personal — and share a story that will push my comfort zone quite a bit — but — the lesson in teamwork is powerful and that is why I want to share it with you, Onward Nation. And so for this solocast — I am following the advice of many of our Onward Nation guests — when you feel that anxiety bubbling up — when you feel anxious about a topic — about a problem — about a situation in your business — you are likely headed in the right direction. Don’t run from it — instead — run toward it. Don’t let your fear overpower you — run toward the situation, Onward Nation — and you will likely be running toward your destiny. You see…your destiny is really big, impressive, and if God were to reveal it to you all at once…it would likely frighten the living daylights out of you…without the context of how you will also grow along the way in order to get there. So today, I am going to share a story about a situation that caused me to grow — it pushed me like I had never been pushed before — and I grew as a result. And then nothing I have faced ever since has even come close to being anywhere close to as difficult of a challenge. Nothing, Onward Nation. Because of this one day…I feel prepared to tackle any challenge — but not going at it alone. No…this is not lone wolf story — this is not a story about individual heroism — or some sort of self-aggrandizing. 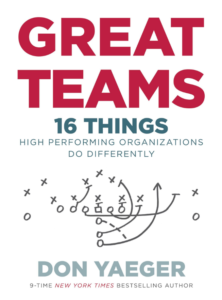 No, this is a story about teamwork and what happens when you and your team decide to follow what my good friend and mentor, Don Yaeger discusses in his newly released book, “Great Teams”…when he illustrates in detail how great teams win in critical situations. And Don’s principle of how Great Teams win in critical situations was so inspiring to me that I wanted to share how I have seen this personally play out and hopefully this story will have value to you — despite how it is pushing my comfort zone to share this with you. To take you deep inside this principle of Great Teams — I am going to take you back to the summer of 1990…June 17, 1990, to be exact. At 18 years old…I arrived at Lackland Air Force Base, San Antonio, Texas. It was nearly midnight — it was still beastly hot — I was exhausted from having been awake for the last 20 hours when I was “processed” early that morning — as they called it in Cleveland, Ohio — to make my way to Basic Military Training School or BMTS for short. Lackland would be my home for the next 6-weeks — and I would be pushed mentally and physically — but more importantly — I would learn the power of the two words teammate. After several long and grueling hours of being verbally broken down mentally, we were able to grab some food, and got introduced to our bunks for the night — which was a few precious hours — and then it was morning again — which came time for my first lesson in teamwork. 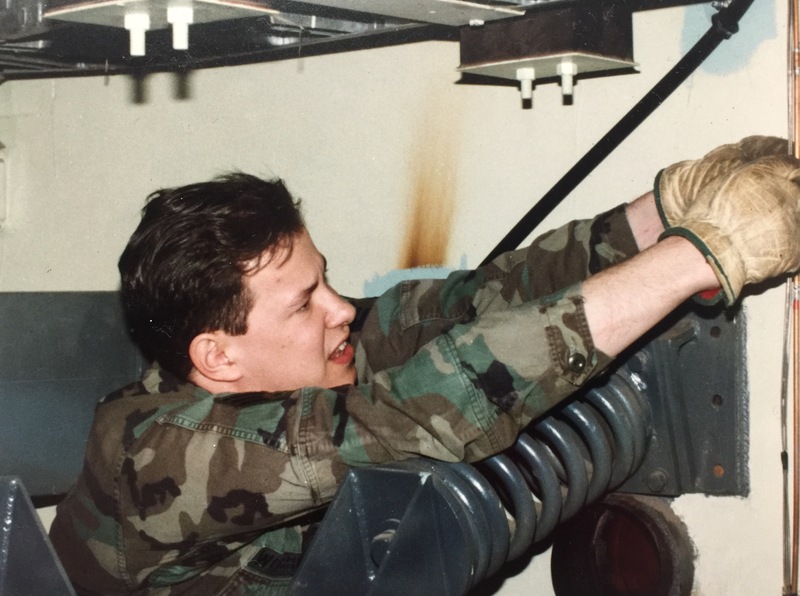 We were instructed quickly on how to make our bunks with excellence — with precision — and what a sloppy bunk meant about you as a person — and what a tight and precise bunk with excellence meant about you as a person. You did not want to have a sloppy bunk. But there was a key ingredient to making a bunk with excellence. We had to perform each step with a teammate…the person who slept in the bunk immediately next to yours. So, tucking in the sheet with hospital corners was a two person job…adding the wool blanket was a two person job…and getting under the bunk to pull every single wrinkle tight under the springs — by sliding your fingers through each spring and pulling all along the frame — up one side and down the other — all the way around the bunk — was to be performed together. Me on one side and my teammate on the other side. And if our drill instructors caught someone flying solo — well, let’s just say — it didn’t end well for that airman — or — the airman who was supposed to be their teammate. I loved the physical challenge…I loved the mental conditioning…I loved the daily obstacles…and I loved the teamwork. I was surprised — because after a week or so — I stopped being fearful and instead — I excelled at every challenge — I now looked forward to each challenge with great anticipation. My confidence was soaring. So much so that I was given a break from my squadron for the day so I could try out for the Air Force’s pararescue team — the Air Force’s special forces. I didn’t make the team — I missed it by four points — but — my confidence soared that I had worked my way through the test. In all, I dropped 30 pounds in the first 10 days of basic…I dropped down to 142 pounds…at 6 feet tall. And six weeks later, I had gained the 30 pounds back except I was now less than 6 percent body fat. Here is a photo that was taken at Chanute Air Force Base several weeks following basic training. The teamwork at Lackland forced an incredible transformation both physically and mentally — and it served as the perfect prep course for what I would experience at Ellsworth Air Force Base in South Dakota. To give you some context…at Ellsworth — or “Hellsworth” as some called it — I would receive the ultimate test of teamwork. Could our team win during a critical situation as Don Yaeger describes in his book? I would soon find out. 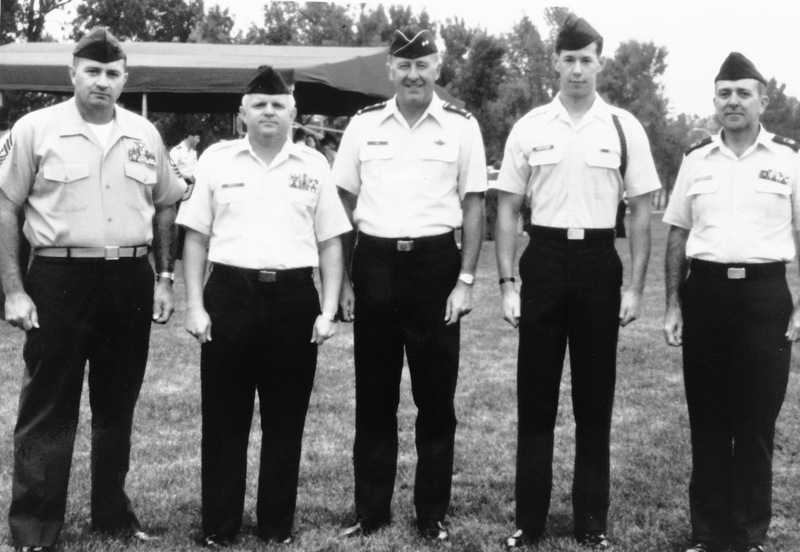 I was assigned to the 44th Strategic Missile Wing at Ellsworth. Yes, I would spend the next 3-½ years working inside the nuclear missile silos of the Minuteman II intercontinental ballistic missile system. 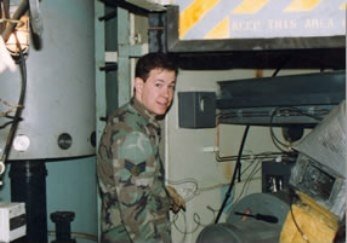 My job as a technician was simple — to keep our systems running smoothly — keeping the systems that kept the nuclear bomb set at the proper temperature — and the missile itself at the proper temperature — and all of the power systems inside the silo — as well as where the capsule crew commanders would sit waiting for launch instructions. We ensured the stability of their systems, too. Yep, Onward Nation…most days…it was like 100 percent pure adrenaline — but — most days — despite what you might think were not necessarily critical situations. I know that may seem odd to say since most days — I worked with 2 or 3 feet from a nuclear bomb — but — it is amazing what a person can get used to pretty quickly. But…one there was one day that stood out from the rest and was truly the most critical situation that I ever worked through — it pushed me to the limits both physically and mentally — I have never been the same since — and I am so grateful to have had the opportunity. It was the summer of 1992…I had been at Ellsworth for 12-months and I was the ripe old age of 20. My office had become the depth inside the silos…and I loved every second of it. And I become pretty good at troubleshooting systems, fixing the systems with my team, and my curiosity for bigger and more complex challenges grew more and more insatiable. Then one day — I met my match — we were faced with the critical situation that required the most precise teamwork. You can listen to the rest of the story inside the episode. Onward Nation, I had a choice to make that day inside the silo. I could have chosen to be paralyzed by fear that was presented to me and my team because of the critical situation, which would have caused us to lose critical time, and then that could have cost the lives of my teammates. Or, we could decide to push through the fear and do what we knew had to be done. I have never been scared. We were all fearful. We thought there was the distinct possibility we might die inside that silo. And yet — despite that possibility — the critical situation was so exhilarating. I felt my blood pumping into areas of my body that I didn’t know existed. It is because winning in that critical situation was a MUST for us…it was not a SHOULD…and we were prepared to take action — as a team — and make the resulting outcome so. No! We were all in. We were PREPARED and fully committed to winning. Winning was a MUST because our lives depending on finding a solution. And we made it so. Onward Nation…most of us when we are fearful in our business — or in relationships — but we are not afraid because we don’t know what needs to be done in the critical situations. Instead, we are afraid to do what we DO KNOW needs to be done in order to win in those situations. The only reason we are afraid is because we haven’t made that opportunity, that decision, that new venture, that new hire, that new business partner…a MUST. JUST DECIDE…make it a MUST…and move forward with gusto, Onward Nation — and win in that critical situation! You will miss all of the shots you never take. You will fail at all of the new product introductions you never introduce. And every high performing employee you never hire and take a chance on will be lost opportunity. And the list of critical situations goes on. So stop the excuses, Onward Nation and instead pursue all of those opportunities with gusto…with proactivity…with all of the energy and enthusiasm that pursuing a MUST requires. As if nothing else matters. Fear will drag you down and keep you there if you let it — fear will keep you from winning in the critical situations. Don’t let it. But realize…it is you who is allowing that to happen because you are manufacturing the fear. It is your creation. But if we follow Kara’s advice…and we do not let fear limit us…then we can rush into that missile silo and diffuse the situation…or we can rush into our businesses, Onward Nation, and ignite the sales forecast, we can hire the team members you know you will need, we can have the courage to invest in R&D, or have the guts to fire the destructive customer that Scott McKain warned us about during Episode 1. And then realize that any of the fears you have associated with that “Dragon” — or the slaying of that “Dragon” — are completely made up in your own mind. Get out of your own head. Just DECIDE — you and your teammates can and will slay the dragon, Onward Nation — just make it a MUST! Don’t be paralyzed by fear. You are more beautiful…more amazing…more powerful than you could ever possibly imagine. You have an abundance of talents and God-given talents and skills within you that you haven’t even begun to reach for yet. Sometimes we all need is a teammate and a critical situation to help us uncover those things so you can see and realize you are powerful beyond measure. My hope for you is that you have realized some of that today while listening to this. He was an excellent teammate and I would have followed him anywhere — even into a nuclear missile silo we thought was on fire. That is teamwork, Onward Nation — and you need to do the same for all of the teammates in your business so you can win in critical situations. I will be back tomorrow with my interview with Rosalie Chamberlain — another one of today’s top business owners. Rosalie and I go deep into self-awareness — and how when combined with collaboration — creates the perfect recipe for success. Don’t miss Rosalie tomorrow — you will be glad you listened. Thanks again for being here today. Until tomorrow, onward with gusto!